It has long been fashionable brands of jeans are made ​​not in the U.S. and Europe, in countries with cheap labor and weak legislation on labor protection. Fashion for the "worn" jeans already claimed hundreds of lives and resulted in disability, thousands of people in the country where the majority of this market segment. Appearance of "rubbing" is achieved through the use of hazardous equipment «sandblasting» (sandblasting), which consists in the fact that a jet of sand with water under pressure is directed onto the fabric. This method has been banned in Europe in 1966, but used there illegally for a long time until it was moved to Asian countries in which we can not take care of health personnel due to lack of proper legislation. And the Chinese or Indian workers are more concerned about tomorrow's not a disease but what he has to feed his family today. Until we go in thought, to buy or not artificially aged jeans, he breathes silica dust, which a year later "wear out" him, making a disabled person. In fact, although some statistics on the incidence of occupational diseases exist only in Turkey as the country seeks to join the EU and its institutions closer to European levels. According to the Ministry of Health of Turkey the number of cases of silicosis in the enterprises, which uses «sandblasting» reached 3.500 people (with a total employment of about 10.000), and many of the original disease diagnosed as tuberculosis. Of these, about 50 people died. Thus, out of every hundred workers 35 sick with silicosis - lung disease leading to disability. Unheard statistics. As a result, Turkey's technology was officially banned in 2009, and primary production has since moved to Bangladesh, China, Pakistan, India and Arab countries, where the situation is almost impossible to trace. Silicosis has long been considered an occupational disease of miners. However, if they have symptoms appear after 20 years of work, the worker standing at the blast machine - just six months. Therefore, public organizations, united in the campaign "Clean clothes", which was launched last week in 15 countries in Europe, demand from the World Health Organization and the International Labour Organization to take urgent: the inclusion of the textile industry in its international program for the global elimination of silicosis. Naturally, manufacturing companies are aware of the harmful effects of "sandblasting". But many prefer to pretend do not know, or nobly outraged. According to a Spanish public organization Setem , one of the organizers of "No Sandblasting", so to include Pepe Jeans, Armani and Diesel, who refused to engage in dialogue and not taken any steps to remove harmful technologies from their factories.Brilliant phrase of Karl Marx that at 300% of profits there is no crime for which capital does not dare to even go in fear of the gallows, it is true today. Only the interest rate was much lower. Nevertheless, under a still stone gathers no moss. Action "Clean clothes" is intended to put pressure on owners of fashion brands that they have eradicated this technology. Besides manufacturing companies should accept responsibility for disability cases of silicosis and begin paying them compensation. Among the planned events - street rallies, collecting signatures and charity concerts. Firms such as Levi-Strauss, Inditex, C & A and H & M has already announced the cancellation of blasting in their factories, but has not yet reported on specific measures of control. But to organize this "technology" required only a truck with sand and high pressure water jet. 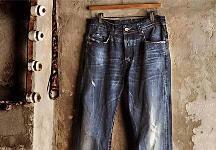 This world-famous brands, as regards the production of fakes in the illegal factories, the situation there is not subject to control ... Five billion "worn" jeans, jackets, etc. annually arrive at the counters of the world stores, including 300 million in Russia, where 90% of the market provide the mentioned countries. Few problems in the world depend on the responsibility of each one of us. Maybe give up the purchase, which kills?